I’ve been a fan of BBQ ribs ever since I tried that perfect rack of baby back ribs. I think it started with a really juicy rack of honey BBQ ribs in Tony Roma’s in Barcelona, Spain. You know what I mean, when the meat really just falls off the bones, and there is a thick caramelized layer of BBQ Sauce all over, lightly blackened by the grill. That’s how I want my ribs. And Tony Roma’s is, to me, still the reference of perfect BBQ ribs. That’s why I learned how to make my BBQ Ribs, so they taste like at Tony Roma’s, right in your oven. For baby back ribs, shopping is quite simple. You need a rack of pork ribs per person, preferably baby back but small spare ribs are OK too. Spare ribs are more massive and meaty and come from the front (belly) portion of the pig. Baby back ribs come from the loin side and are usually smaller and less fatty than spare ribs. Plus, they are more tender. I personally always prefer baby backs on my plate. Also, look for some good BBQ sauce. I like the Bull’s Eye brand, especially the classic or Kansas City style sauce, but the BBQ sauce market offers lots of more specialized flavors and even home-made varieties that taste amazing. Just pick something that appeals to you! For gear, we will just use your oven at a convenient 350°F, and you will need a high baking pan as well as some aluminum foil to cover. That’s all! 1. The ribs need to be butchered a little before cooking. I refer primarily to the back side, where you need to remove the membrane skin that lines the entire back side. If not removed, the flavor will not enter properly into the meat, and the surface will get tough when grilling. Enter with a sharp knife and create a small cavity where you can stick a finger in. Work yourself sideways with your fingers only and tear off the entire skin on the back. 2. Pre-season the ribs for a few hours with a nice rub, marinade or BBQ Sauce. I like a marinade made out of Sesame oil, Soy sauce, Ginger, Garlic, Chili, Tamarind sauce, vinegar, sugar, and salt. Don’t add too much salt at this stage, as salt will dry up your meat while it’s seasoning. Add the salt in the next step. 3. Before cooking, rub the ribs with salt and pepper, put them inside a baking pan and cover them with BBQ Sauce. Make sure to add lots of sauce as water will evaporate, and the juices will concentrate. When you think you’ve added enough, add some more. You can sprinkle a few drops of water, too. Cover the pan tightly with aluminum foil. 4. Pre-heat the oven to 350°F and put the baking pan inside. Bake for roughly 2 hours, opening every 30 minutes and basting the meat with the BBQ sauce that accumulates at the bottom, or even add fresh sauce. Bake until the meat falls off the bone easily. 5. Before finishing, remove the aluminum foil and baste again with BBQ sauce. Put the pan right under the broiler and turn up to high heat for a few minutes to nicely caramelize the BBQ sauce. It should not get black or burnt, just slightly brown. Remove from the heat afterward and let sit at room temperature for 3 minutes. 6. Serve with your favorite sides. I love Cowboy Beans, French Fries or just a baked potato. Ah, and don’t forget to lick your fingers every now and then! As an alternative, in case you hate washing dishes as much as I do, you can also wrap the individual racks, covered with BBQ sauce, directly in aluminum foil and place these “packages” in the oven. After you’ve filled your tummy with these finger-licking goodies, you won’t have to worry about cleaning up. I do that almost all the time. 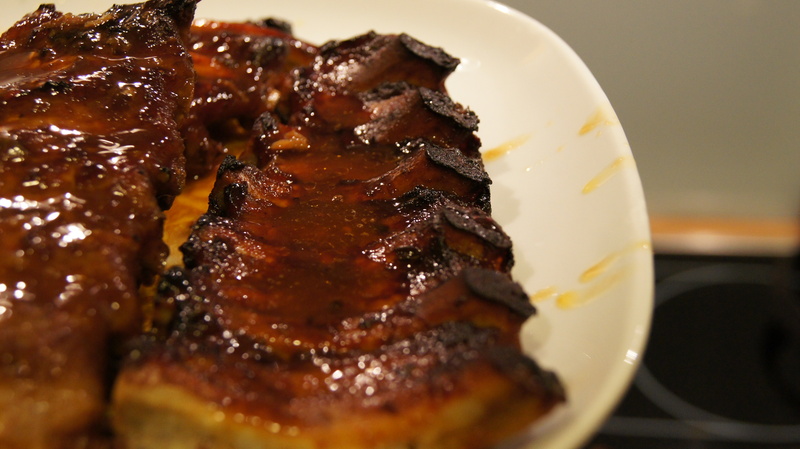 Thanks for this fantastic BBQ baby back ribs recipe. The secret is really to add enough BBQ sauce. What recommend additionally: after grilling the ribs, I sprinkle grated lemon zest on top with a microplane. I have this idea from Ferran Adria, where he describes a ribs recipe with BBQ sauce.